WELCOME TO THE PRODUCT ROOM! Here you’ll find only medical-grade and prescription skincare products, with clinically proven results back by science. The Roseville Dermatology Product Room is a full service resource for your skin care needs, from anti-aging to acne to hyperpigmentation. We believe strongly in educating our patients on the science behind each and every product. 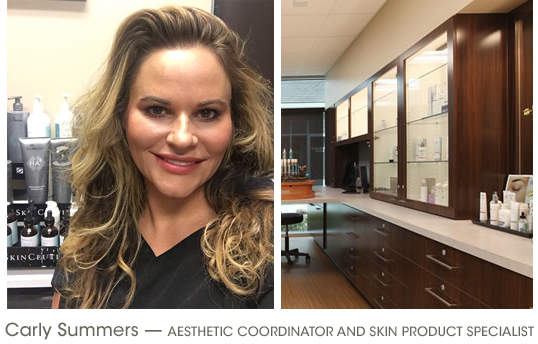 Our certified product specialist, Carly Summers, will work with you to design a comprehensive but personalized skincare program, tailored to your skin type, concerns, goals, and budget. Stop in to browse our products anytime or schedule an appointment with Carly in the Product Room. Sign up for our quarterly 90-Day Skin Challenge to start your process toward healthy, glowing skin!